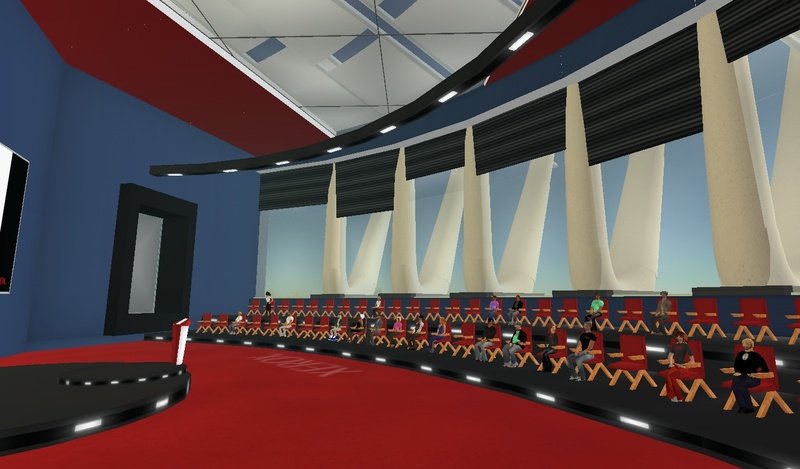 Xerox’s virtual presence, developed by Beta Technologies, was officially presented on Fenway Park in Boston to an audience that has seen Second Life for the first time ever. Loosely inspired on the “office park” theme, the major areas of Xerox’s sim are two building complexes, one for an auditorium, the other a pavillion for partners. There are also areas for a dance floor, some lounges and chill-out areas, as well as a short track to experiment the virtual recreation of the Xerox Nu-Ness motorbike. The launch event, besides being a mixed-media event, also included, on the in-world side, a panel discussion on the possibilities of virtual worlds, hosted by Linda Jacobson from Xerox PARC, and having as panelists Bob Moore from Xerox PARC, Ron Meiners from Multiverse, Sandra Kearney from IBM, Jonas Karlsson from the Xerox Innovation Group, and Eggy Lippmann and Gwyneth Llewelyn from Beta Technologies. After the event, in good, old, Second Life tradition, the audience met for some dancing and chatting. See also the article on the Rochester Democrat and Chronicle, the Xerox “Big I, little t” Blog, and on UgoTrade.